Ed. note: Yesterday, we unveiled the latest TWTV Hall of Fame nominations. Today, we provide Andrew Rabin’s statistical analysis of our seven nominees. If you’re a sports fan, particularly a baseball fan, there is a good chance you have heard of Bill James. If you’re not a sports fan, however, you probably have never heard of Bill James. That’s a shame. At one point, it seemed like there was a good chance you would have heard of him; when Steven Soderbergh was adapting Moneyball, his plan was to include James as an animated, wizard-like character. You would have certainly remembered him then, right? Unfortunately (although fortunate for the film’s Oscar prospects; I think it’s safe to say that Jonah Hill is not an Academy Award nominee if he had shared screen time with an animated character, Michael Jordan-style), Aaron Sorkin cut the James character out of his redraft. James may have been mentioned once or twice, but he certainly was not a memorable part of the film. But James is a significant figure in sports. Any time you look at advanced statistics, you are either looking at his own creations (Runs Created, Win Shares, Pythagorean Winning Percentage), or something inspired by James’s work. But unless you have dug deep into your favorite player’s baseball-reference page, you are probably not familiar with the “Hall of Fame Standard” and the “Hall of Fame Monitor.” In essence, these statistics combine a whole lot of stats from a player’s career and determine how deserving the player is of making the Baseball Hall of Fame (Standard), and how likely the player is to be voted into the Hall of Fame (Monitor). My goal was to create a similar statistic for the TWTV Hall of Fame. The Monitor cannot be replicated at this point—three inductees is too small of a sample size to determine what factors the voting public really considers when determining if a show should be inducted. The Standard, on the other hand, is a more objective look at all elements of a player’s career, and that can be translated to television. And with that, I present to you, AIRS. 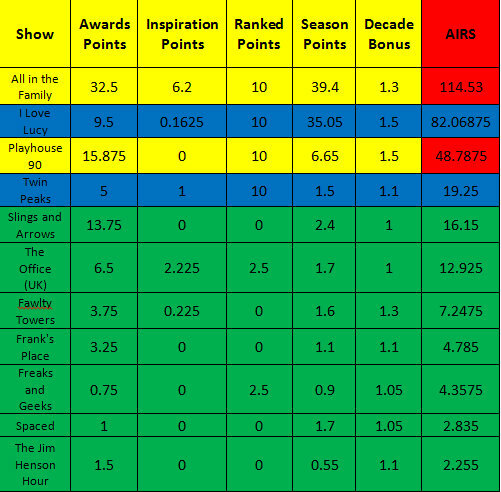 AIRS—or Awards, Inspiration, Rankings, and Seasons—attempts to present a relative score to determine what show is more deserving of a Hall of Fame spot. Let’s look at it element by element, with 11 shows—this month’s seven nominees, and four of September’s nominees. I have not included Sesame Street or Saturday Night Live, as the ongoing nature of those shows would skew the results. With 4,326 episodes, Sesame Street would be far and away the highest ranked show without inputting any of the other data. The first thing to point out is that Emmy Awards are replaced by BAFTAs for British programs and Gemini Awards for Canadian programs. From here on out, these will be grouped with the Emmys, but I am referring to all three awards that fall under this category. This provides our first major skewed result: while any television show that airs in the United States is Emmy eligible (see Downton Abbey), the Gemini Awards nominate only television that is produced in Canada. This limits the number of eligible shows, and therefore increases the potential for eligible shows to get nominations. It should be no surprise that Canadian Slings and Arrows takes the lead in awards points among the eligible shows. The awards points are weighted. Emmy series wins receive five points apiece, while series nominations (not including wins, no double-dipping) receive three. Emmy wins for acting (lead, supporting, or guest), directing, and writing receive three points each, while nominations in those categories receive one. All other Emmy wins—including editing, cinematography, makeup, and basically everything else that doesn’t air in the primetime ceremony—earns one point, with those nominations receiving a half point. These are also category-specific—for example, because The Jim Henson Hour was a variety show, Outstanding Directing of a Variety Series falls in the second category. The Golden Globes are also included, and those are the same for shows from all countries. 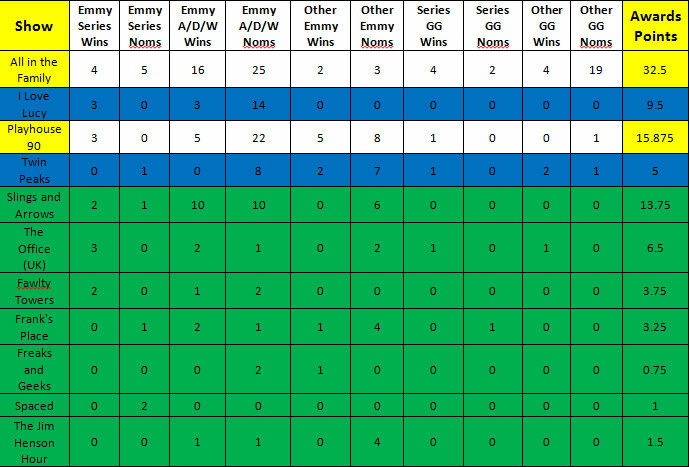 Shows receive two points for a series win, one for a series nomination or a win in another category, and half a point for other nominations. I chose to include the Golden Globes rather than more respected awards like the Television Critics Association Awards because the Globes go back much further to honor older television. The Office (UK) gets a major bump here from the American remake, and that bump isn’t quite over yet (depending on when you’re reading this, that 178 number might already be too low; The Office (US) will hit 198 episodes when it ends this May). 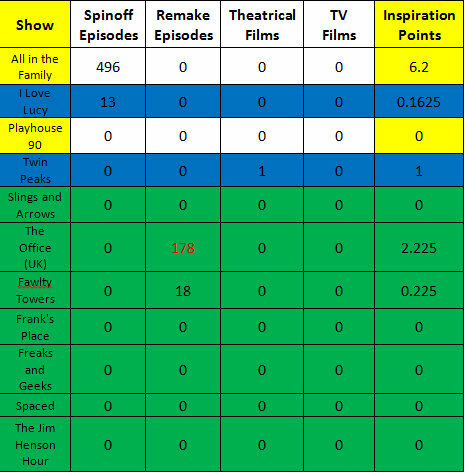 The number of episodes of a series’ spinoffs or remakes is divided by 80, although the reasoning of this is one-quarter of the episodes divided by 20, rather than a straight division by 80. Each episode-based number (another of which we’ll get to later) is divided by 20 in order to create a basic “seasons” number. For the episodes of spinoffs and remakes, we take a quarter of that number. Shows get one full point for each feature movie based on the series, and a half a point for each made-for-TV movie. One important factor with the inspiration category is that only the first level of series and films is considered. With a show like Star Trek: The Original Series, for instance, only the six films and two series that were spinoffs of TOS are considered, rather than everything in the franchise. For that reason, while The Office (UK) will still receive credit for the rest of the American remake, it will not be gaining points for The Farm spinoff, should that be picked up. The rankings section is the simplest to explain. A show received 2.5 points for being listed in James Poniewozik’s 2007 list for Time Magazine of the 100 Best TV Shows of All Time, and 7.5 points for being listed in TV Guide’s 2002 list of the 50 Greatest TV Shows of All Time. The TV Guide list is worth more points since there are fewer places on it. I’ll be honest, I’m not thrilled with this category, and if any of you can suggest other all-time lists from well-regarded sources, let me know. As described earlier, for episodes, the number of episodes (and only episodes that actually aired are included) is divided by 20. Seasons that ranked number one in Nielsen ratings for a given season got five points, seasons in the top five got three points, and seasons in the top 10 got one point. The problem is international shows. International ratings, especially historical ones, were too difficult to find. 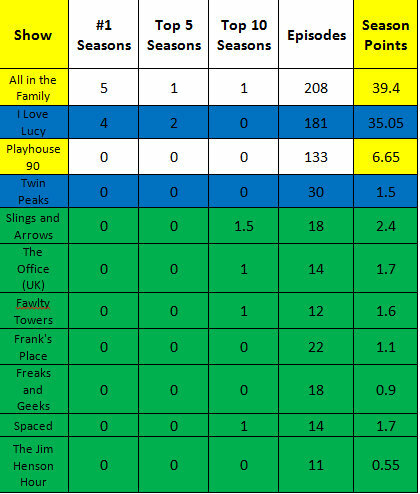 So for non-American shows (in this case that would be Slings and Arrows, The Office (UK), Fawlty Towers, and Spaced, the shows got half a point for every season they aired. In this case, I used the actual seasons that were considered as such. If anybody has access to British or Canadian ratings, let me know, and I will make a change there. The final element is a multiplier for when the show aired. This is particularly important in countering a balance in the awards category, where the number of awards has grown, and therefore is likely to favor more recent shows. Scores for shows that aired before the 1960s get multiplied by 1.5; shows that aired in the 1960s–70s get multiplied by 1.3; shows that aired in the 1980s–90s get multiplied by 1.1; and shows that aired since the 2000s get no multiplier. If a show crosses multiple decade groupings, the two multipliers are averaged. All of the shows nominated in this round actually fall below what I would consider an acceptable Hall of Fame AIRS score of at least 25, but so did Twin Peaks. When a show has too few episodes, the stats skew very low. Additionally, with such low seasons points, any one factor can greatly influence the rankings. Had Slings and Arrows aired in the United States, its award points would almost certainly decrease along with its score. So, which of these shows are statistically Hall of Famers? 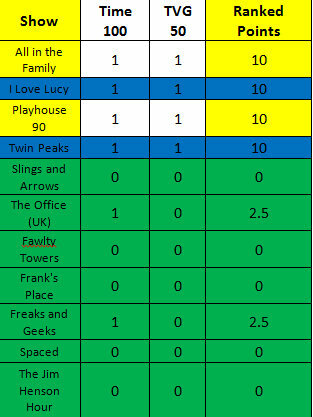 In this case, I would pick the three shows which reach their scores through at least three of the categories: The Office (UK), Fawlty Towers, and Freaks and Geeks. I would rank Slings and Arrows and Frank’s Place as shows to be considered, and Spaced and The Jim Henson Hour as not Hall-worthy.